As I find myself having more ideas than time to construct them, I can at least outline them so they aren't forgotten (perhaps someone else might even pick them up). Hopefully I can also get feedback along the way. One thing that is unchanged from vanilla is the way trading works. And the mechanic itself holds up well. We can browse the trader's inventory, see what stuff costs and how much there is, and see whether or not he wants to buy something. If we are not sure whether or not the trader would buy an item from us, we have to offer it, hear their 'nope, won't buy' speech, and then put it back into our inventory by hand. Not a problem in itself, but exhausting if done for many items. Idea: When trading, have items in your inventory that cannot be traded be marked/shaded/whatever, so that we can instantly see what the trader does not buy. The mechanic doesn't have to be changed, just mark the items. Traders have a limited amount of money. It would be neat if we could see that, so we know when we have to stop offering stuff, without trying to offer smaller and smaller items. If we sell identical items, they clutter the inventory by being listed singularly (even though stacks can be handled as well). It would be reasonable for Tony to show use one stack of 12 9mm mags instead of 12 single 9mm mags, no? When selling large quantities of items (like, say, using Flo to sell several truckloads of obsolete guns at once), we have repeatedly go to strategic, move guns into her inventory, go to tactical, sell them, go to strategic again... it would save a lot of time if we could access the sector inventory in tactical, at least while trading. Anyway, feedback (and further ideas) welcome. That's probably one of the easier things to be done if the shading is done dynamically and not by some fixed graphics overlay. I would love to see that. Requires interface work though unless you want to print the remaining amount of money somewhere in the brown area below his face. One thing that might also work is to shade our items with a value above the remaining money. The constant need for updates might be bad for performance though. As long as it's full magazines I agree. All other items usually shouldn't stack as they have a different status which we need to see. This may be the reason why Sirtech didn't bother to stack magazines. Never had that problem as I always had a team selling stuff but it was tedious to put all the stuff into the mercs inventory and later drop the items that couldn't be sold in the sector again. 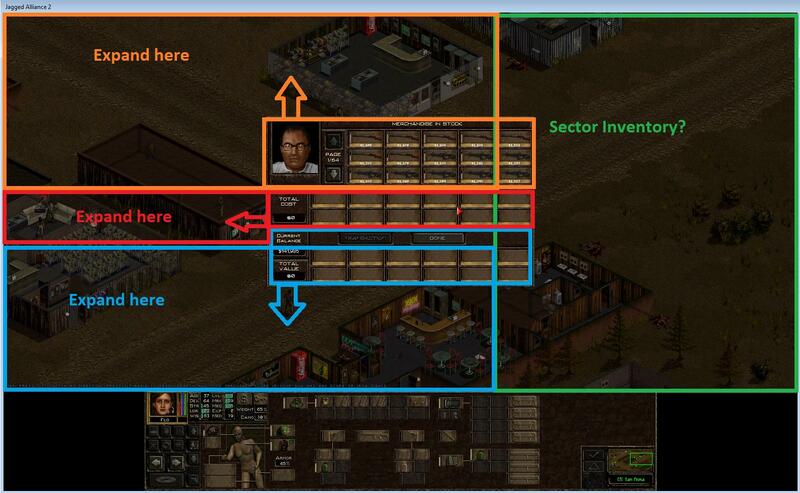 Would certainly be nice to sell directly from sector inventory. Again - requires interface work. The interface is taken from fixed pictures inside STIs so unless you find a nice way to modify these on the fly you will have to add pictures for the different resolutions. That's one reason why people hate interface work so much. At least I do. Nice ideas but apart from point 3 and (maybe) 1 there is interface work required. @1 Sounds great and helpful up front, and even more so if.when the strategic inventory is made accessible. @2could the remaining money for a merchant be overlayed on their picture? that might not be the prettiest option but it would be useful enough. @3 not sure on this part so much because I generally convert ammo to boxes, so its many less items to deal with, but in general I certainly think stacks are easier to handle than singles for management. @4 its sad it requires the extra work, but this would be super helpful both ways buying and selling with the changes in militia where buying decent guns isn't just for a few select people but sometimes large groups. @5 More slots would be nice, though if #4 is set up, its a lot less needed since you could just work from sector inventory and most the time it would transition fine, even save a step since usually you pick up a limited # of items and then have to drop them and pick them up using the sector inventory anyways to get them on the right toon. Perhaps instead of more slots, a set of tabs so once you opened a merchant you could have multiple characters (say the squad the Merc that starts the talk is in) so you could access all your buy/sell squad by having them nearby. Perhaps instead of more slots, a set of tabs so once you opened a merchant you could have multiple characters (say the squad the Merc that starts the talk is in) so you could access all your buy/sell squad by having them nearby. You can already do that. Just move your mercs to Tony's room and start the trade. You can switch between the mercs and access each merc's inventory. That's how I usually do it. Pick up as much as I can with each merc, move the whole team to Tony's room and start selling until he runs out of money. Don't you have to exit tony and re-click him for each merc? Guess I'll try that next time I load the game up, So cool I learned another trick. never can have too many of those, Thanks. The problem with those kind of tricks, as cute as they are, is that they are not very intuitive. I'd very much prefer the solution of extending the merchant inventory. The option of also showing part of the sector inventory in the trade menu sounds very appealing to me. This sounds like a fantastic idea. All of it. From the way it sounds in regards to work load, I would probably suggest to implement the "budget remaining" overlay on the portrait first.